Superb high quality travel carry cover for wedding dresses, bridesmaids’ dresses & ball gowns etc. Breathable cotton-like polypropylene material on inner side with soft touch showerproof PEVA on outer side. Ivory colour run resistant. Ideal for transporting and long term storage of your precious garments. Plenty of room for trains and petticoats. Can be hung full length. Size: 72″(182cm) long x 26″ (66cm) wide with 9″ (23cm) gusset. 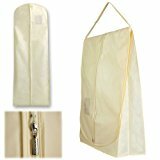 Easy to use Carry cover for Full length wedding dresses and gowns. Full length at 72″ (183cm) and Extra Wide at 26″ (66cm).